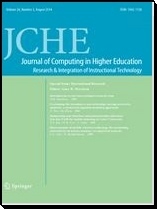 Journal of Computing in Higher Education, JCHE, publishes original research, literature reviews, implementation and evaluation studies, and theoretical, conceptual, and policy papers that contribute to our understanding of the issues, problems, and research associated with instructional technologies and educational environments. JCHE publishes well-documented articles and provides a comprehensive source of information on instructional technology integration. Priority is given to the publication of rigorous, original manuscripts concerning research and integration of instructional technology in higher education. JCHE provides perspectives on the research and integration of instructional technology in higher education. * For member access to the current issues published by Springer, click on the 'Member Login' button.